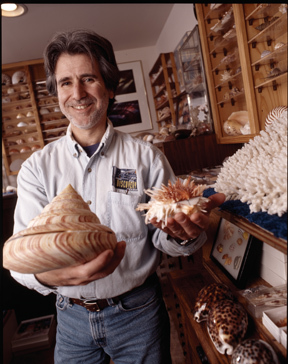 Goldberg, a writer-producer at Hopkins' Applied Physics Laboratory who specializes in producing videos for NASA space missions, began collecting shells when he was 8. Today, he has some 10,000 snail species, many of them rare, in his painstakingly organized and documented collection, including a monstrous 40-pound Syrinx and an onion-colored golden cowrie, with a beautiful shine that appears kiln-forged. "That is one of the first things people say. 'Did you paint them? No, this is as they come out of nature," Goldberg says. "Basically, what you are looking at is a piece of calcium carbonate that the snail created, and it created it in such a way that it is [one] of the most beautiful natural objects in the world, bar none."